We delight in the art and science behind making our rums--The careful transformation of sugar cane into a rarified essence. We aim to share our passion for the craft with you. It is our enduring pursuit to innovate and perfect the process, always preserving the flavor and character that make Don Q the preferred rum in The Land of Rum, Puerto Rico. With an enthusiasm rivaled only by our passion for quality, we've invested significant time, knowledge, and resources making our distillery one of the cleanest and greenest in the spirits industry. Not only do we reap the benefits of real energy return and useful post-production materials, we get to do what's best for the people and wildlife of our lovely island, Puerto Rico. Our company legacy is a living force that drives our constant quest to perfect the art of distillation. It is the collective wisdom passed down through six generations of the Serrallés family in over 150 years of crafting rum. Our commitment to the people and techniques that define Don Q have made us the #1 rum in the Land of Rum: Puerto Rico. 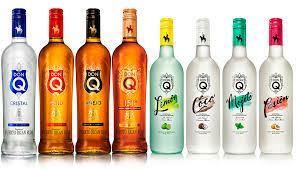 Now available in the US, we're confident you'll enjoy our steadfast devotion to the excellence of Don Q.